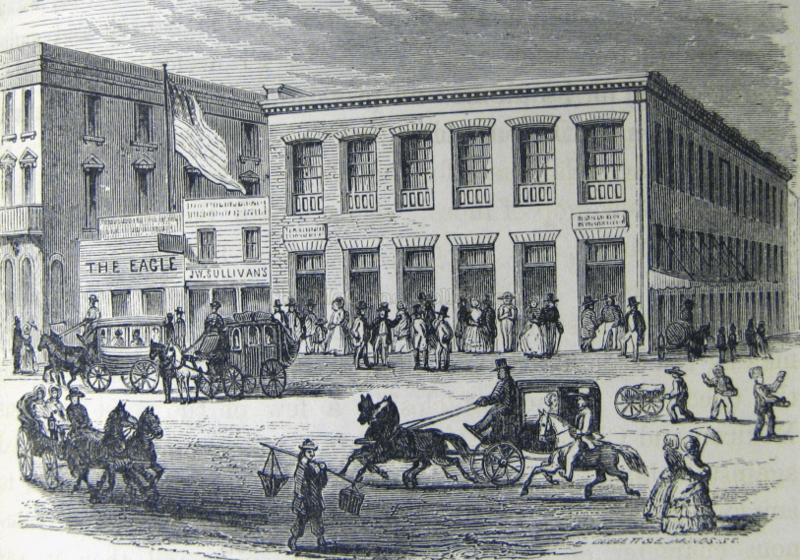 The intersection of Clay and Kearny in 1854, from the Annals of San Francisco. Image courtesy of the McCune Collection. Mike Brannigan claimed (a bit dubiously) to have been the first cabdriver in San Francisco. What is true is that he was one of the city's earliest drivers for hire. 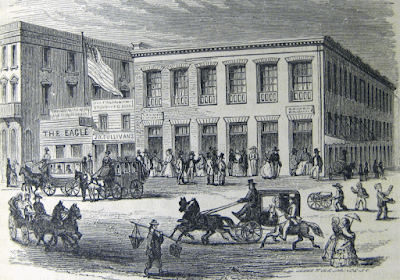 He was there in the early 1850s, driving passengers around San Francisco, while the frontier settlement transformed from a collection of tents lined up in the mud, into a real-ish city of wood and brick. Illustration from the Annals of San Francisco, courtesy of the McCune Collection. San Francisco's early street conditions were not always favorable to pedestrians--to put it mildly. Riding in a carriage was much nicer, and since almost nobody owned their own carriages, cab and hack business was booming. There was always $75 in a duel. It was at San Mateo they generally fought; for though it was all right to get into a shooting scrap on Montgomery street, the Sheriff used to chase the boys if they went potting at each other after thinking the matter over all night. The first one I had on hand was between Ned Tobey and another young fellow—I forget his name. Hall McAllister was Tobey’s second, I remember, and four shots were fired, though nobody was hurt. Then I took out Miles D. Truitt when he fought Colonel Washington the newspaper man. The Sheriff chased us all over the sand hills, but the affair came off all right, and Washington wounded Truitt in the shoulder. Another time General Walker had a row with Joe McKibben, and I drove out the General and Colonel Kewen, who was seconding him. All such matters was a sure $75. 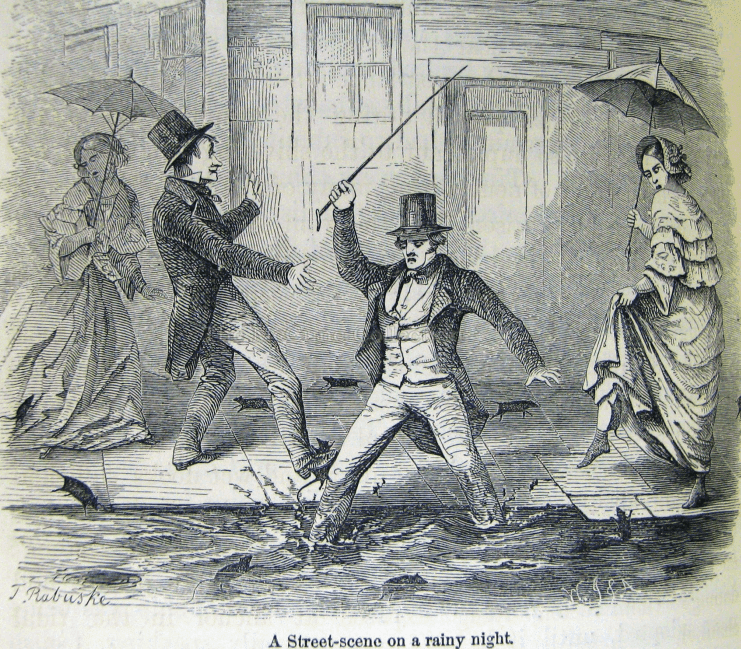 As San Francisco history buffs will recall, the most famous casualty of the city’s early dueling craze was Senator David Broderick (now remembered chiefly for the street carrying his name). Though Mike was not Broderick’s cabdriver on that occasion (another cabbie, Owen McFarland, did the honors), Senator Broderick played an extremely important role in Mike’s career, as we shall see shortly. Mike’s first appearance in the news was in 1852, when a certain Ira Cole attempted to “annihilate Michael Brannigan with a broomstick;” the case was dismissed when Brannigan refused to press charges. As the tale goes (and since it was Brannigan who told the tale, it may well be a very tall one), Mike had co-owned San Francisco’s first hired carriage, along with fellow Irish immigrants Johnny Crowe and Jim Travers. Mike’s relationship with Crowe and Travers went through some ups and downs. In July of 1852, while still driving for Crowe and Travers, he drunkenly carried a lamp into the stable and almost set it on fire; in September Crowe and Travers tried to get him jailed on trumped-up charges (as related in Part One). By October of 1852 he was driving for a different livery stable, but managed to get in a fist-fight with Johnny Crowe when they both tried to load the same passenger at the wharf. 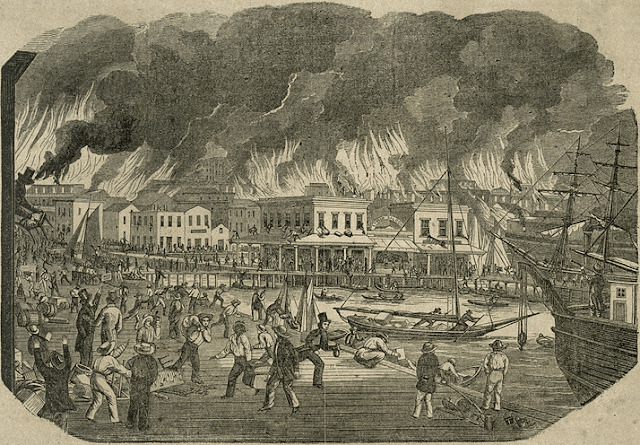 The Great Fire of 1851. Image courtesy of www.famsf.org. After this Brannigan managed to stay off the police blotter for an entire year. This personal record was perhaps helped by the fact that the city’s population was overwhelmingly male, averaging about twenty years old, armed to the teeth, drinking heavily, and desperately in search of riches by any means necessary. This was the time and place where the word “hoodlum” was coined. Somehow, despite their history, Brannigan started driving for Jim Travers once again (Crowe had branched off into his own business). Apparently, Travers had not learned his lesson from earlier experiences with Mike Brannigan. The expression, “once bitten, twice shy” was about to acquire a new meaning. During a fight which ensued, Brannigan bit the end of Dougherty’s nose entirely off, and also a piece out of his cheek. [Dougherty] was also wounded in the head, and the physician testified that about one-fourth of the nose was gone. Court cases in those days tended to resolve very quickly, by our standards, but this one dragged on into February of 1854, when Mike Brannigan was found guilty of assault and battery... and then immediately pardoned, by no one less than the Governor of California, “Honest John” Bigler. Yep: Mike had that kind of protection. Remember Ira Cole, who Mike forgave for attacking him with a broomstick back in 1852? Mike wisely chose to make amends with Cole, because Cole (man about town, part-time boxer) was the right-hand man of “Dutch Charley” Duane (San Francisco Fire Chief, retired boxer). For these guys, being both politicians and boxers was not an accident. Together they oversaw a gang of street toughs who helped make sure elections went favorably for the Tammany-esque political machine run by San Francisco’s first party boss—Senator David Broderick. Governor Bigley was one of Broderick’s many allies, and he wasn’t above protecting "one of the boys" if called upon to do so. and, when all else failed, stuffing ballot boxes. Mike's second job came with some great benefits--best of all, a "Get Out of Jail Free" card. Throughout his career, Mike knew how to schmooze up to powerful people, and he was always willing to do whatever dirty work was needed to gain their trust.